Compassion for the Family/Vida Reavivida Inc. takes domestic violence against women very seriously. It is imperative that women and their children be offered a safe refuge. Compassion for the Family/Vida Reavivida Inc. is committed to providing this service that is so badly needed in Puerto Vallarta and the surrounding area. In order to provide this service, Compassion for the Family/Vida Reavivida Inc. is constructing a shelter in a discrete location in the greater Puerto Vallarta area. Non disclosure of location of the facility is imperative if the organization is to be able to provide a safe refuge. Compassion for the Family/Vida Reavivida Inc. does not actively seek out women that are physically abused. Compassion for the Family/Vida Reavivida Inc. does not remove women from an abusive environment nor does it involve itself in domestic disturbances. Compassion for the Family/Vida Reavivida Inc. accepts women and their children to the shelter exclusively by Desarrollo Integral de la Familia (the social services organization in Puerto Vallarta and the municipality of Bahia de Banderas). Initial staffing of the shelter will consist of a male/female couple serving as live in volunteer facility managers and up to four additional volunteers. They are responsible for the day to day activities at the shelter and supervising the actions of the volunteers and the shelter guests. The facilities managers answer to the board of directors. Volunteers will be provided room and board while assisting at the shelter providing that space is available. After the construction phase of the project, Compassion for the Family/Vida Reavivida will require on going support to help pay for food, hygienic items, cleaning products, maintenance, clothing, taxes, insurance and salaries. After the purchase of an appropriate building site we will be construction a building of sufficient size to initially house six families. There will also be living space for a facility manager, two employees and up to four volunteers. The building will be constructed in such a way that additional living space can be added at minimal cost and minimal disruption of the services being provided. All building costs will be funded by donations and through fund raising events. Future additions will also be funded by donations and fund raising events. Construction will be done by a paid project supervisor and volunteer groups. 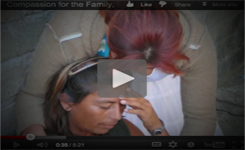 The following video will help to inform you of the problems facing women and children in the Puerto Vallarta area as well as what Compassion for the Family; Inc. is doing to minister to them. Please take a moment to watch the video by click play in the video screen. Thank you and we hope this will be a helpful tool in raising the awareness and helping to find solutions to the problems facing these women and children. What's happening to women in Mexico?